Comment & Win Mobiwatchman Mobile Application Every Week! Today is World Telecom Day, Over the last 19 months TelecomTalk has been growing each month, and that’s because of you, our lovely interactive readers. That’s why we want to give you something back. So we thought to giveaway 15 Mobiwatchman Mobile Applications FREE worth Rs.199 each, every week for the Best Commenter a good way to repay you for your loyalty. The Mobiwatchman is first of its kind mobile application developed by Pune based Optinno Mobitech Pvt. Ltd. Which can help its users to get rid of unwanted calls and SMS as earlier we shared on TelecomTalk. Guidelines for Selecting Winner or “Best Commenter of the Week”. Commentator will be selected depending on number of worth full comments he/she makes. Comments which are helpful to other people or review on telecom and mobile services will be given preference, like you can try helping other commentators questions by your telecom knowledge or user experience or make the review on the news published on telecom talk. Give appropriate working email ID while commenting,which helps me to contact you if you win. The contest is open to all individuals who are a resident of India. Best Commentator of the week will be announced on every Tuesday. For Example “Best Commentator” for this week will be announced on May 25th. One winner will be declared every Week. Same winner can not participate for the rest of the draw. Mobiwatchman mobile application is available for only mobile phones that run on Symbian OS. 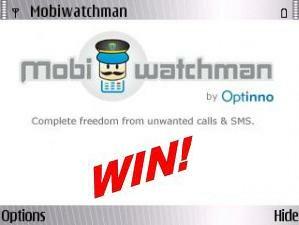 So what are you waiting start commenting to Win Mobiwatchman Free now !! Thanks Sanjay & Telecom Talk…..I will try it on my n73…. In this week, “Avishek Ghosh” has won best commentator of the week contest and Mobiwatchman application.